In my middle teens I was a tremendous enthusiast for the ideas of EF Schumacher and his book Small is Beautiful, the idea of Self Sufficiency as propounded by John Seymour, the ecological agenda; and I had also read the precursors of this nascent 'Green' movement with William Cobbett (1763-1835) with his Rural Rides and Cottage Economy; the work of Henry David Thoreau such as Walden and his Journals; and the utopian socialism of William Morris (A Dream of John Ball and News from Nowhere). However, this stream is now polluted and almost all of the modern 'Greens' are (fanatically-) devoted to membership of the European Union (with a single massive and unopposed European Government, Law, Currency, Economic policy, Population and - now Military), multi-national institutions such as the United Nations and World Health Organisation; international laws - and in general massive, powerful and total bureaucracy. This old strand of traditionalist, small scale, simple, local and rurally-oriented patriotic 'environmentalism' became utterly (and with barely a protest) dominated and subverted by the New Left with its unquestioning adherence to antiracism = unlimited mass immigration = social destruction and replacement; the marriage and family-busting agendas of feminism and the sexual revolution; and an environmentalism based upon the fake science and world-control fantasies of Carbon Dioxide-caused Anthropogenic Global Warming - aspiring to monitor and regulate every living thing on the planet. After half a century; 'Green' Environmentalism is merely an Establishment tool, a spearhead of the billionaire 'Illuminati' of the evil global conspiracy. I have a book, inherited from my great uncle, called The Book of Saints and Heroes by Mrs Lang who was the wife of Andrew Lang, the well known Victorian compiler of fairy tales. My copy was published in 1912 and it's the oldest book I have. It has twelve beautiful coloured plates and many more black and white illustrations, all by someone called H.J. Ford of whom I haven't heard but who was clearly a master of his art. I never met my great uncle as he was one of the generation killed in the 1st World War but I feel the book gives me a small link to him and I value it for that reason. But that's not the only reason I have kept it when so many other books have gone to the great library in the sky. The stories of the early saints are so inspiring and so beautiful, and they are told here in such a way that brings them vividly to life. The dedication of these saints to God is total and though that does put one's own efforts into rather sad perspective, it is also an encouragement to set your shoulder to the metaphorical plough. One of the stories is called The Apostle of Northumbria and it's about St Cuthbert. It tells how in the 7th century the young Cuthbert, who was living in a monastery, though not yet a monk, had so damaged his knee that he could no longer walk. One morning as he was lying at the edge of a forest, trying to forget his pain, he saw a man dressed in white and riding on a white horse coming towards him. The man stopped and talked to Cuthbert, asking why he did not get up to greet him. Cuthbert explained the problem with his knee at which the stranger made some suggestions as to how it might be cured and then departed. The cure worked and Cuthbert was persuaded that he had been visited by an angel. 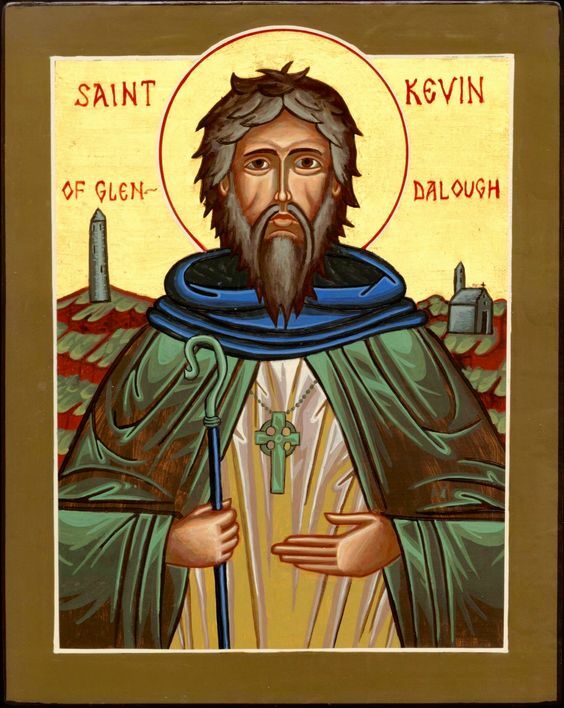 This inspired him to become a monk and devote himself entirely to God. He then spent several years as a priest travelling around the north of the country doing missionary work and spreading the word of the Gospel which at that time was still fairly shallow rooted in those parts. He was much respected for his asceticism and much loved for his kindness to the sick and the poor. He even gained a reputation for healing to such a degree that he became known as the Wonder Worker of Britain. At one time when Cuthbert was giving instruction to the nuns at a place called Coldingham he was seen going out at night. 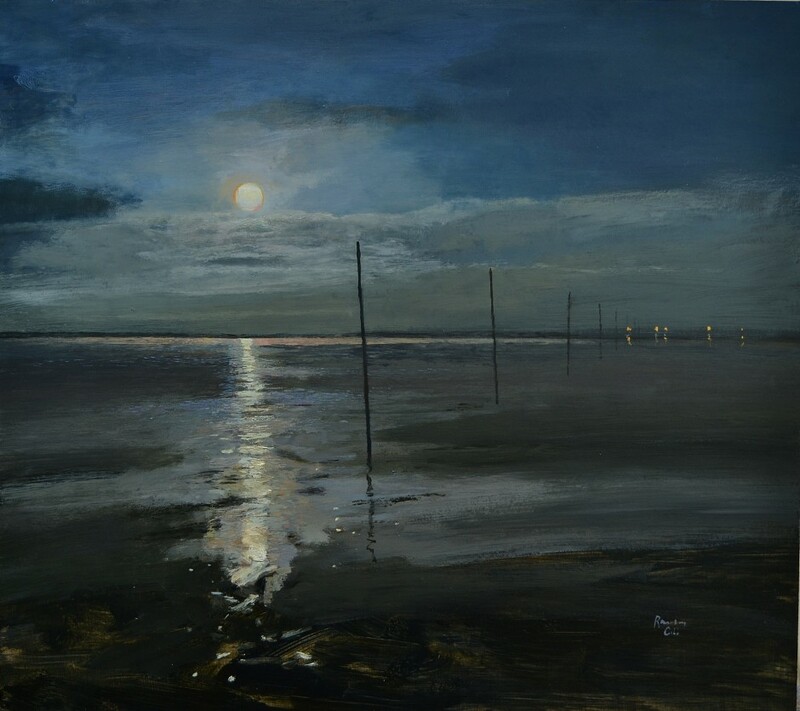 A monk, curious to know where he was going, followed him down to the seashore where, to his astonishment, he saw Cuthbert enter the water and walk out until it reached up to his neck. There he remained until dawn, chanting the praise of God. When he came out of the sea two seals swam towards him and breathed over his cold feet to warm them after which they rubbed him dry with their bodies. The monk confessed to Cuthbert that he had spied on him and told him what he had seen. But Cuthbert asked him to keep it secret because he did not want to be thought holier than he was. The fact the story has come down to us rather implies that the monk failed in this duty! In 664 Cuthbert was sent to the island of Lindisfarne to teach the monks there the rules of the holy life for they had grown careless and each followed his own will. Although he was resisted at first his patience and example won the monks over and they eventually returned to proper practice. His work in Lindisfarne completed, Cuthbert yearned for the solitary life and with the consent of his Abbot he withdrew to Farne Island to dedicate himself to prayer and contemplation. However duty called again and in 684 he was made Bishop of Lindisfarne. He travelled far afield in that capacity, serving his flock tirelessly but eventually with advancing age he was allowed to resign his office and return to Farne Island where he eventually died, much loved and venerated by all. His body was brought back to Lindisfarne where for 11 years it was left in its coffin in the church so that the people might pay their respects. After that time the monks wished to transfer his bones to a specially built tomb near the high altar but when they opened the coffin they fell to their knees in astonishment. The saint lay as if asleep, his body uncorrupted, and all the funeral vestments in which he had been wrapped were still fresh. Two hundred years later the monks at Lindisfarne had to flee from their island as Vikings attacked the northern coasts. They carried the body of Cuthbert and his relics with them and these they took first to Ripon and then to Durham where in 1104 Cuthbert's body was placed in the new cathedral where his relics are still kept today. According to Simeon the Chronicler, even though the saint had died more than four hundred years previously, his body still bore the semblance of life. There was also found in the coffin a copy of the Gospel of St John and this is supposed to be the oldest Western book that still keeps its original leather binding. This is just one of twenty three stories in The Book of Saints and Heroes. There was a time when all children would have been brought up with tales about such inspiring figures as these, either in literary form or else told as stories by their grandmothers or other older relatives and teachers. It's a sad time when the young are denied access to examples of spiritual heroes whom they might be inspired to emulate or, if not that, then at least know that there are such people in the world. P.S. My 11 year old son just looked at the picture here and commented "That looks like Gandalf", to which I thought "Maybe it was, or his equivalent." P.P.S. Regarding the uncorrupted state of Cuthbert's body, if I was asked if I believed in that I would have to say yes. The resurrection of Christ proves that the inner spirit can master the outer body and I don't see why a soul of sufficient purity and holiness might not have a body that reflected that. There are too many accounts in spiritual history just to discount this as a pious fiction. But for them this was only the beginning of the real story. All their life in this world and all their adventures in Narnia had only been the cover and the title page: now at last they were beginning Chapter One of the Great Story which no one on earth has read: which goes on for ever: in which every chapter is better than the one before. Theologians of the Orthodox Church talk often about the Eighth Day - the great day of Eternity that will dawn at the consummation of this age, once the seven Biblical days of creation are completed. The light of this Eighth Day to come shines on and around us even now, but our spiritual vision seldom seems sharp enough to sense it. Sometimes, however, it bursts through into human consciousness, the Transfiguration of Our Lord on Mount Tabor being the outstanding example, a prefiguration of the Heavenly City and the regenerated, phoenix-like world to be revealed at the end of time. It's no overstatement to say that C.S. Lewis's Narnia books played an analogous 'Eighth Day' role for me as a boy. Between 1979 and 1982, from the ages of 9 to 12, I lived and breathed the rich, suggestive air of Narnia. It felt like home; my natural element. 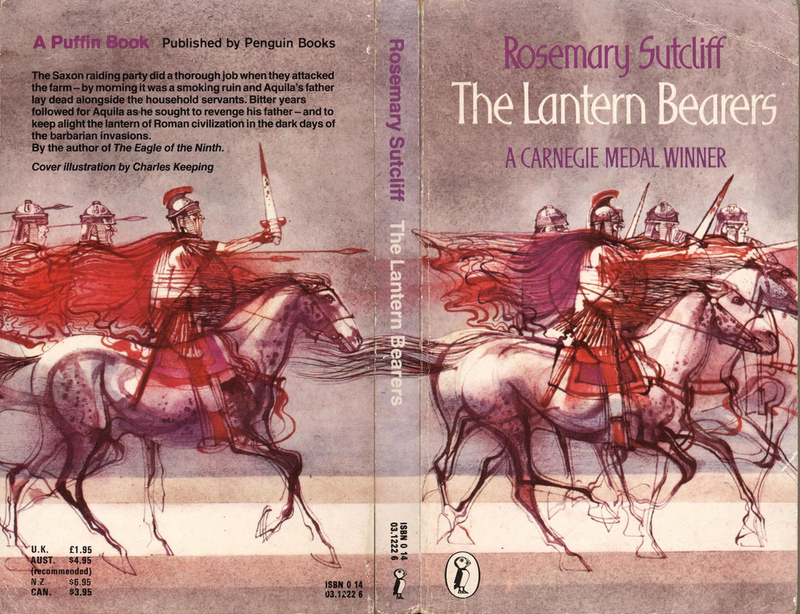 Before I'd even read a word of Lewis I had stood enchanted in our suburban South Manchester bookshop, captivated by the cover of The Last Battle - the bonfire, the stable, Jill's bow and arrows, Eustace's sword, and the mighty red lion emblazoned on Tirian's shield. One Friday night as well, in January or February 1981, I had a particularly numinous dream, which saw me personally involved in The Lion, The Witch and The Wardrobe, playing my part in the battle to liberate Cair Paravel. Afterwards, Aslan sat us all down in the courtyard and told the most fantastic story, which I was sure I'd be able to remember when I woke up, but which, by breakfast time, was already escaping my memory. It was a bright blue late winter Saturday, and in the afternoon my Dad took me to Old Trafford to watch United play Leeds. We got caught up in a spot of hooliganism, I recall, on the Mancunian Way after the game, but for all the excitement - both the football and the fisticuffs - it's the afterglow of Aslan's story in my young mind that makes that day so memorable. 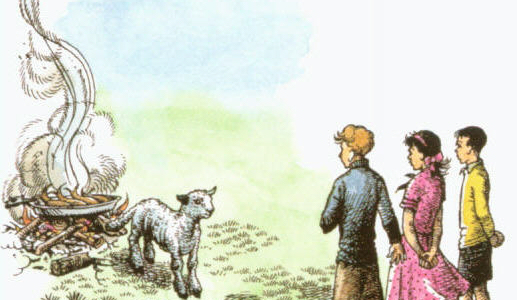 It's clear to me now, thirty-five years on, that the Narnia stories plugged a huge spiritual hole in my life. Together with Roger Lancelyn Green's mythic retellings (especially his King Arthur book) they filled the sacred space that my ancestors had known since time immemorial but that had been left empty for me by the abolition of the Latin Mass in 1970. And what Lewis did for myself - a Romanised Gael from the North West corner of the Empire - he did for countless boys and girls around the world, with all kinds of backgrounds and all manner of circumstances, and goes on doing today. He is a storyteller and a witness, a prophet and a bard, a princely, and surely heaven-sent counter-presence to the demythologised, dechristianised temper of our times. I was certain that before the final conflagration took place this book would reveal itself and make its holy yet homely presence felt in the world. I hoped and prayed that I might be present when it did, and often I would imagine our school's classrooms and corridors dissolving and giving way to the stone passageways, cavernous halls and lantern-lit chambers of the Grail Castle itself. In a tiny chapel, I was sure, at the top of a spiral staircase, the Grail and the eighth Narnia book stood between the candles on the altar, waiting for the appointed hour - the Kairos, the supreme moment - to roll around at last. It's interesting, looking back on it all now, to see how much has changed in our world but also how little. We live, after all, in equally uncertain times, and many's the moment when I see, or think I see, the mise en scene of my current working life - the computers, the drinks machines, the carpeted stairs - collapse and reconstitute themselves into the form and fabric of Carbonek Castle. And I'm there -sprinting through the echoing throne room, then up the spiral staircase, starlight glinting through the narrow slits of windows. At the top I find a wooden door, closed but with a soft and radiant light spilling out onto the floor at the bottom. I turn the handle - push, pull and shove - but there's no give and the door stays shut. I bang my head on the wood in frustration, then stiff my mind and pray: 'Oh God, if ever I've done anything good in my life, give me a glimpse please of that which I've always seeked.' The door swings open and next thing I know I'm kneeling down, gazing into the heart of the Grail's golden blaze as it fills the room and bathes my soul in its healing, transfiguring light. There are six tall candles on the altar, three to the Grail's left and three to the right. I see flowers as well, and a flicker and swish in the air like the beat of angels wings. An ancient, bearded priest in green - Joseph of Arimathea himself, perhaps - sits on the right, while three men kneel with heads bowed low right in front of the altar. I can't see their faces, but I know who they are - Galahad, Percival and Bors - the three Grail knights. Standing on the left is a female figure robed in red with a face like the sun, holding an open book in her hands, silver in colour with a mighty red lion emblazoned on the front. She reads aloud - sings rather - in a language I don't know but for some reason am able to understand as well as if it's my own. Her chant - high, strange and wild - reverberates around the chapel and I recognise and remember what it is she's singing - the long lost story, no less - the story Aslan told us in the courtyard, the selfsame tale, I realise now, that Lucy read in the Magician's Book in The Voyage of the Dawn Treader, the one about the cup and the sword and the tree and the green hill, the one she rates as the loveliest she's ever read and that Aslan promises to tell her again and again for ever and ever. Over-excited and carried away, I scramble up and dash into the room, arms outstretched. But a puff of wind laced with flame blinds and singes my eyes, and I'm ushered out of the room by a host of invisible hands and bundled down the stairs. Darkness engulfs me and when I come to I'm somewhere else altogether. A fresh, briny, morning smell, probes and pushes my mind awake. I'm met by lapping waves in front, white cliffs behind, and a canopy of pale blue, seagull-flecked sky high above. There's sand beneath me, rough and bristly to the touch. I stumble to my feet. The sun, rising behind the cliffs looks huge, five or six times its normal size. That's when the other smell hits me - familiar and reassuring - the smell of breakfast - fresh coffee and roasting fish. Something catches my eye, small and bright, towards the sea and to my right. It's a lamb, tending a cooking fire and a burnished bronze coffee bowl. 'Come and have breakfast,' he says in his milky voice. 'This is all a dream,' I say to myself. 'Like the one I had about the fight at Cair Paravel when I was a kid.' I look behind me again, fully expecting to see the big sun vanished and the fixtures and fittings of the office restored to their habitual reality. But no, it's still there, even bigger than before if anything. I can look straight at it too, without even needing to shield my eyes. I crouch down, pick up a fistful of sand - spiky and spongy at the same time - and watch it trickle down and stick to my fingers. It's unmistakably real. And there's a brightness in the air and on the ground and a joy in my heart which assures me that this is no dream. Then I start to understand. The dream, in fact, is over. This is the morning. The dawn. The Eighth Day has begun. I stand up, turn and face the sea, and walk towards the Lamb. Spiritually, this represents the pre-modern religious ideal of all Men leading the same life i obedience to God's Laws. What we have in modernity can be represented by each voice having an independent line (autonomy, agency, self-determination) but without any regard for the overall effect. The consequence is dissonance - the clash between voices, leading to a perception of incoherence. Dissonance was, perversely, embraced by the corruption of modernity as an ideal in its own right - even when there was no independence of voices, but block chords. So, the individual is symbolically denied independence and agency - but in-effect forced to participate in dissonance. The future? - well perhaps it can musically be gestured-at by independence of voices - counterpoint - simultaneous with harmony; each person's agency symbolically combining with each other's in an overall harmony. Of course this cannot be written down or composed, since that would be to deny the agency of the voices - the harmony derives from mutual, chosen Love of each with others. On the face of it the subject of this post doesn't have a right to be here because, technically speaking, Albion is not in France and vice versa. Indeed, the Normans are very proud that perfidious Albion never captured le Mont Saint-Michel during the 100 Years War, though it did capture the small island of Tombelaine not far away. 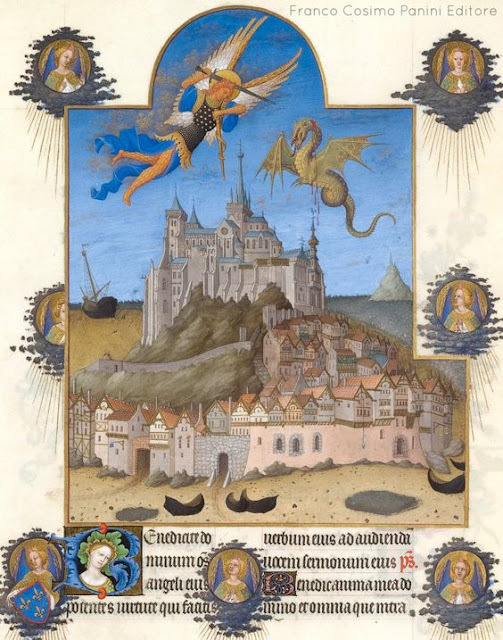 But because the Mount with its abbey dedicated to St Michael is such an important Christian pilgrimage site, and because of the link between England and Normandy, I feel it does earn its place on this blog. We must also remember the connection of this part of France with Arthurian legend via Lancelot, and the fact that the original Bretons (le Mont Saint-Michel is right on the border between Brittany and Normandy) were exiles from what is now England, driven out of their home country by Anglo-Saxon invaders. There are other connections too. Mont Saint-Michel has a twin site in Cornwall in St Michael's Mount, another monastery on an offshore island that's sometimes accessible by foot, with which (quoting from Wikipedia) "it shares the same tidal features and the same conical shape", though St Michael's Mount is much smaller and less imposing than its big brother in France. 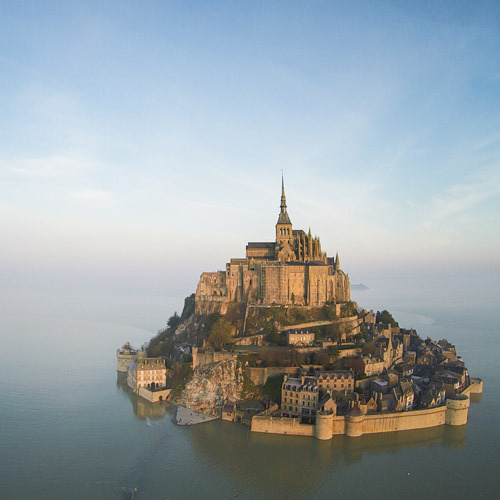 And Tolkien enthusiasts should note that Minas Tirith, in the Lord of the Rings films, was modelled on le Mont Saint-Michel. In the year 708 A.D. the Archangel Michael appeared in a dream to the bishop of Avranches, a town in the south west of Normandy, and told him to build a church on a rocky island that lay in the large bay at the mouth of the river Couesnon a few miles away. The story goes that St Michael had to return three times before he was believed and, even then, could only convince the bishop of the truth of the vision by sticking his finger into the bishop's head! The poor man's skull, complete with hole, still exists for all to view in the Saint-Gervais Basilica in Avranches. So the church was built, and in the 11th century a Romanesque abbey was constructed with Gothic style refectory and cloisters added 200 years later. Further buildings were completed in the ensuing centuries until in 1895 a statue of St Michael himself, dragon underfoot, was put at the top of the spire giving it its current appearance. Inevitably at the time of the French Revolution the island and its buildings were converted into a prison but that was closed in 1863. Monks began to return in the 20th century and now there is a small community of monks and nuns living there continuing the tradition of prayer and worship. 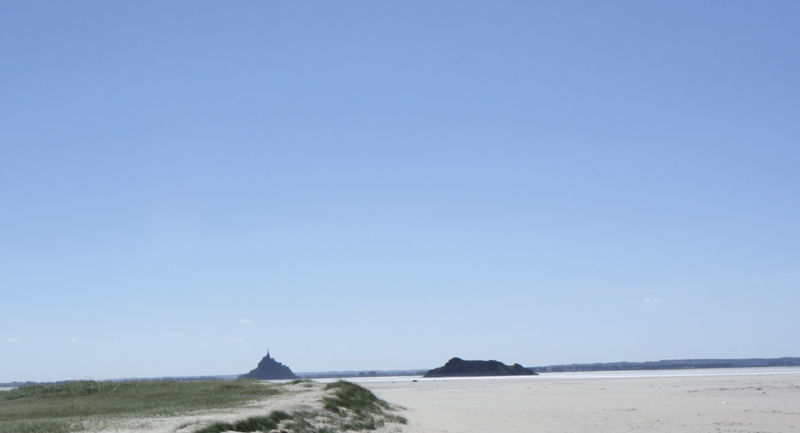 Whether by accident or design le Mont Saint-Michel is a microcosm of the medieval world or ideal Christian society. At the top there stands, representing God, the Archangel Saint Michael protecting the monastery founded in his name. Then comes the Benedictine abbey and monastery where the monks lived their lives in prayer to the Creator. Below there are the halls for noble guests (the aristocracy) and then shops, houses and, outside the walls, dwellings for those that did the more menial work required to keep the whole place running. Even today when you visit the Mount, as around three million people do every year, you have the feeling of ascending through the world towards God. You enter by a large gate with a 15th century captured English cannon to your right. There is a bustling, noisy crowd with shops selling tourist knickknacks and lots of restaurants. As you climb the winding path that leads to the top the crowd seems to thin out slightly. The climb becomes a little more difficult, the steps steeper, and eventually you leave the commercial world behind and stand in front of the abbey doors. Up you go to a large platform outside the main church from where there is a magnificent view of the bay which on a clear day is a truly glorious sight. Then you enter and immediately you are in a different world in which the mundane is left behind and the sacred is all important. It is quiet, even with a still fairly substantial number of people walking about, and the vaulted columns of the choir lift one's spirits heavenwards. And now a speculative suggestion. The patron saint of England is St George who was a Roman soldier of Greek origin born in Palestine, a strange choice for a national hero you might think. However Edward III adopted him for his courage in combating adversity and as an example of the triumph of good over evil, demonstrated by his killing of the dragon. Now the only other saintly dragon killer I am aware of is St Michael who crushed Satan and threw him down to earth after the great rebellion in heaven. So I am led to wonder whether St George is actually a human representative of the archangel and whether England might not, in some way, be also under the patronage of St Michael. Of course, many other places would be too but Michael was apparently the most popular saint in medieval England after St Peter, and before the Reformation many churches were dedicated to him, often on hilltops such as the one on Glastonbury Tor. This is pure speculation, I admit, but the idea that certain places have angelic protectors is well known in esoteric teachings and if that is the case then why not nations too? I. Who is like unto God. 2. Recorder of the deeds of men in the Heavenly Books. 3. The Celestial Medium through whom the Law was given. 4. Captain of the Heavenly Hosts. 5. Slayer of the dragon of evil intention. 6. Guardian of the Holy Sanctuaries. 7. Preparer of the Way before each Messenger from God. 8. Leader of the Church Triumphant in Heaven and Militant on Earth. From these titles we can see that St Michael is not someone to be trifled with. He is a warrior and it seems to me that we need his assistance in fighting evil now more than ever. It is a good time to remind ourselves of his continued presence as God's strong right arm. Between 2006 and 2009 I studied for a Master's degree in Modern European History at the University of Manchester. I struggled a lot, if I'm honest, with the taught elements of the course. The baleful influence of Michel Foucault was all-pervasive, and the M.A seemed more concerned with Sociology, Critical Theory, Gender Theory, and all manner of post-1968 isms than with actual History. I was, however, treated like the adult I was and given carte blanche to develop my own historical interests, which resulted in my dissertation on spiritual, cultural and intellectual life in Vichy France. What has stayed with me most from my thesis is a topic which took up only half a page at the time but has blossomed and borne imaginative fruit within me since - the image of a house in particular, a house of redemption and hope, discovered, as if by magic, in the midst of hills and trees in the hidden, mystical heart of a conquered and divided country. 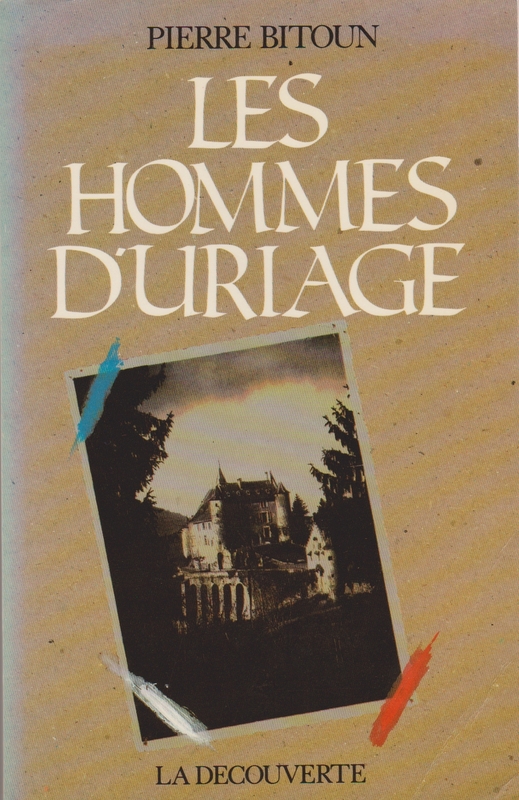 Pierre Dunoyer de Segonzac (1906-1968) was a French tank commander, so dismayed by the defeat of 1940 that he took matters into his own hands and established a school for a new generation of French leaders in an ancient chateau at Uriage in the foothills of the French Alps. De Segonzac, a monarchist by temperament, recruited a team of facilitators with a variety of political and religious beliefs but one shared faith in the absolute value of the human person and an awareness of how the facile slogans of Fascism and Communism were divesting the human person of his or her native depth and grandeur, reducing that precious, unrepeatable personhood to a one-dimensional caricature. Plus est en nous was the Uriage motto. 'More is in us'. De Segonzac blamed Europe's slide into totalitarianism on liberal democracy and its impoverished understanding of what human persons need to live a fulfilled and complete life. The liberal order, in its materialistic assumptions, is unable to think in terms of faith, family or national solidarity. All these are marginalised or sidelined, leaving a vacuum which extreme ideologies are only too glad to fill. The Uriage adventure began in December 1940 under the aegis of the Vichy regime, but as time ticked on De Segonzac became increasingly disillusioned with the growing German influence on Marshal Petain's government. In December 1942, shortly after Hitler's invasion of the Unoccupied Zone, he vacated the chateau with his team, dispersing into the forests and hills to join the burgeoning Resistance. There is a story - I'm not sure now whether I read it in my studies or if it's the product of my imagination - that on the last night De Segonzac stood before his staff in the Great Hall in front of a roaring fire with a knife in one hand and the Tricolore in the other. He cut the flag - solemnly and sacramentally - into seven pieces, handing each colleague a fragment and vowing that after the war they would meet again in Paris and make it whole once more. I don't know if they did or even, as I say, if I made the whole episode up, but Uriage has haunted my imagination ever since. There is one image especially which often recurs - a little like the lamppost of C.S. Lewis's dreams, perhaps - that of a young person - sometimes a girl, sometimes a boy - fleeing their home city, wandering lost in the countryside, searching for hope and inspiration, then, when all hope seems lost, stumbling by night on the house, rising out of the mist like the Grail Castle, moonlight glinting on the walls and lamps ablaze in its windows. It is exactly this kind of house that C.S. Lewis portrays in That Hideous Strength (published in 1945, so also a child of the Second World War), with the community of St. Anne's on the Hill. It is a humble house and a small community, pitted against a mighty and inexorable foe - the National Institute for Coordinated Experiments (NICE), installed in palatial surroundings at nearby Belbury. A battle unfolds in provincial England between archetypal Good and Evil. The men and women of St. Anne's are not nor never will be feted or even mentioned in the press. It is a secret battle, and this is a secret community, representing the hidden England, Arthurian England, the land of the Pendragon, Arthur's successor, the head of the household and head of the true, if for now concealed realm behind the nation of surface reality. One thinks as well of the monasteries and remote religious settlements set up in Britain and Ireland during the fifth and sixth centuries as Imperial Rome collapsed into a patchwork of rough territories and embryonic kingdoms. Hermits like St. Kevin of Glendalough retreated to the furthest, most windswept, rain-beaten extremities of the British Isles to escape the world's chaos and live a life of silence, solitude and prayer. They didn't anticipate that people would follow them to these outposts. They didn't foresee the extent to which Britons would see such integrity in what they were doing, such depth of meaning and purpose, such models and exemplars of what human flourishing, both individual and communal, could be. They had no conception of how their tiny religious houses would play a greater role in preserving the best of the past and laying the foundations of the civilisation to come than all the armies and chieftains senselessly criss-crossing post-Roman Europe. These are the houses which feed the imagination and plant the seeds of hope in a coming restoration of the Good, the Beautiful and the True. I see in my mind's eye a teenager - a girl or a boy - stumbling sometime in the future, after our current age has run its course, on a small stone church hidden in the woods. Inside it is dark, save for the candles and the blazing iconostasis, where, next to angels and saints, is the icon of a house. 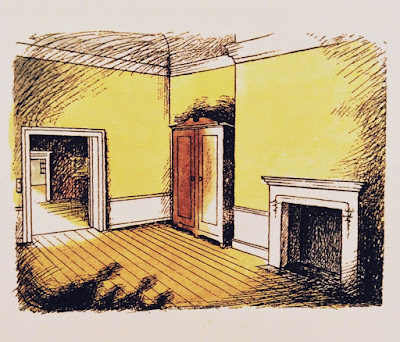 Moonlight glimmers on its walls, smoke puffs from the chimney and the rooms are aglow with lamps. Figures can be glimpsed through the windows, kneeling, reading, writing, talking or looking out onto the starry night. And above the icon, in big bold letters of gold, our teenager reads four short French words: Plus est en nous. I was fortunate, last night, that I took a walk at a time just before the Lunar Perigee when the moon approaches her closest to earth - and that (for a couple of minutes) the solid cloud covering parted to reveal her. Then, this morning at 05:30 I got a full and clear view as she rode down towards the horizon. Last night I felt a fast shimmer of energy as I gazed on the moon, this morning I was dazzled. Yet, on reflection, all this physics is to negate and diminish the event: The real point about the lunar perigee (as about all phenomena) is consciousness and communication. Consciousness means it is personal - the moon personal, myself personal. Communication is intentional and purposive. The importance is that this was a communication, with the intention to speak to each of us as an individual. And whether we 'get it' is up to us. In February 1985 I returned to England after five years away living in India. In those days of my relative youth five years felt a lot longer than they do today. Now they don't seem much at all. But back then it seemed an age since I had last been in England and, as I drove west from London to my parents' house, the countryside appeared quite new. It was early morning. The sun had just risen and there was a thickish frost lying on the ground. You can imagine the contrast to the heat and strong colours of the subcontinent. Part of me did feel as though I had come home but, on another level, it was as if I had entered a magical kingdom, one that was familiar yet otherworldly. The dawn sunlight on the frosty fields added to that feeling and so did the fact that since I had left England my parents had moved from the suburbs of London to an 18th century house in Wiltshire so what I was seeing now as we drove through the country really was different to what I had left. It was England but not the one I had known. A rural rather than urban place with very little of the artificiality and dead soul quality of the modern environment. There is a timeless quality to the Wiltshire countryside, and one can quite easily imagine it as it was in prehistoric or Neolithic times. This was a feeling I was often to have in the next month or so. I had no immediate plans so, while I was sorting out what to do, I stayed with my parents in their house which was just outside the small town of Calne. This is very close to a number of ancient English sites of which the best known is Avebury around 8 miles away. Avebury is part of a complex that includes Silbury Hill and West Kennet Long Barrow, and I visited all these places many times then. They are tourist sites now but they still have a strangeness that speaks of a different sort of consciousness to the one possessed by 20th and 21st century man. We struggle to define it but it was probably based on a sense of the immanence of nature. Nature to early human beings was alive. There were spirits in everything and the whole world was perceived as a manifestation of creative energy. Whether they had an idea of a transcendent Creator is another matter. Probably they did, and he was perhaps associated with the sun, but I imagine their principal spiritual focus was on the spirits they could perceive in some way in the natural world. I have the idea that at major festivals these spirits would appear more fully to them, drawn by the concentrated group aspiration of the tribe. Avebury was obviously a major centre for this kind of spirit worship, though communion might be a better way of describing what went on, and it is not mere fancy to claim that one can still detect distant echoes of this at the site. The rough and weathered stones perhaps carry within them a memory of the remote past that a sympathetic imagination can respond to. This all took place a long time ago. Human consciousness has moved on since then as our sense of a personal self has crystallised and we have a more intellectual approach to reality. This is both a loss and a gain. The loss can be keenly felt by the sensitive soul and we are reminded of it when we visit sites like Avebury. We have lost the sense of participation in nature, the felt sense of oneness. But this loss is also a gain as we become more active agents in life. This has been the path followed over the last few thousand years and it has reached something like a peak today which explains, in part, the widespread feelings of alienation. Now we have the task of moving into a new consciousness that combines the best of both worlds, an active rather than a passive union with life in which both individuality and oneness are preserved and, in fact, made stronger. We cannot retreat to the past though many try to. We cannot rest in the present though most of us appear to want to do so. We must forge ahead into the future which requires fully embracing a spiritual world view, preferably focused on Christ who is the best exemplar of the higher state, while retaining the fruits of our developed individuality and mind. This will eventually make us full participants in life and even co creators with God. In Wiltshire, and no doubt elsewhere but it is powerfully felt here, there remains a strong sense of the old country and the old ways. We can be inspired by this, refreshed by it in the godless world of today, but we should not try to recapture it as it was then. Life moves on and the law of life is growth. It would be just as mistaken to try to go back to the early days of human consciousness as it would be for a grown up to try to return to childhood. And yet we should also remember that "unless you change, and become as little children, you shall not enter into the kingdom of heaven". The future consciousness of man should build on the past but not imitate it. It must include but go beyond oneness with nature to reach a conscious sense of true spiritual understanding which is as different from the passive awareness of the past as the mind of Christ is to that of Adam. For Adam represents primeval man when he was one with creation, or part of it, but Christ demonstrates a true and fully self-conscious oneness with the Creator, an individual union with the Father in which the keynote is love. Last weekend I visited York with my family. We expected beforehand to receive an impression of different layers of history - Roman, Anglo-Saxon, Medieval, Tudor, Stuart, Georgian, etc - interacting and intertwining. That had been the dominant motif on previous trips, but what struck us particularly this time was the general ambience of harmony, centredness, order and proportion; at once profoundly human - firmly rooted in the everyday - while reaching up to Divinity in its spiritual vision and aspiration. 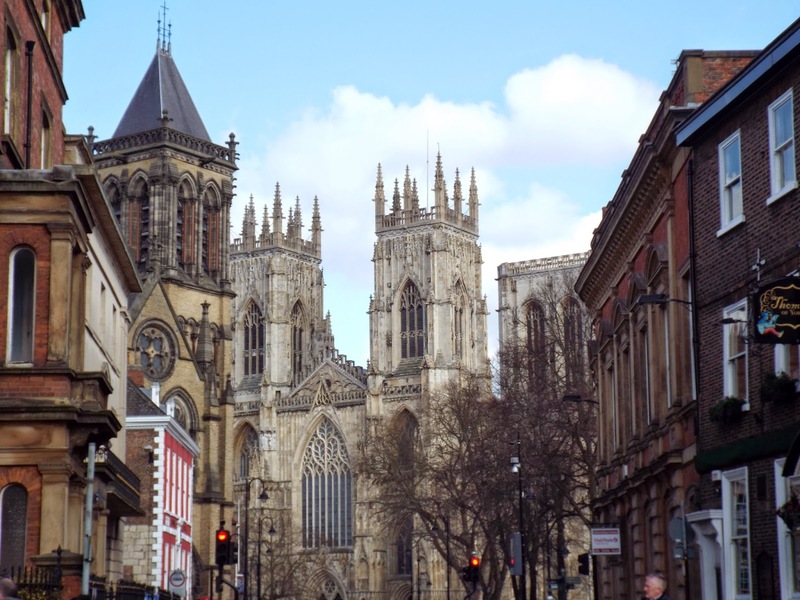 York Minster, the largest Gothic Cathedral in Northern Europe, is the hub at the centre of the wheel, setting the tone with its mass, height, beauty and scale. Its light-coloured stone lends it an unobtrusive softness which offsets its bulk, while its towers can be spied from all angles and quarters. We found it a wholly benign presence, an embodiment of Tradition watching over the town and its inhabitants like a wise and kindly father, holding York's smaller churches - St. Michael le Belfry, St. Wilfrid's, St. Olave's and others - under its wings, it seemed, giving them the freedom and space to flourish and act out their own vocation and role. The Minster bells ring out every quarter of an hour. For around fifty minutes on Saturday afternoon, between four and five, they played an astonishingly beautiful tune, which I wish I could remember now but know that I would recognise instantly were I to hear it again and associate it always with everything noble and pure. Wheeling our son around the Dean's Park next to the Minster and the cobbled streets radiating out and around, I had the sense of each and every one of us - tourists, street traders, hen parties, beggars, men watching football in pubs, everyone - caught up in a great Platonic music, which rang out in Heaven before the foundation of the world and will carry on sounding forever and aye. There was something of eternity in that music, something healing too. It felt true and right. It felt like home - comforting, familiar and secure - qualities which our current model of society seems all too often all too keen to dismantle from within - to mock, belittle, undermine and subvert. This is what the poet Kathleen Raine called the 'Great Battle' of our times, and it is a contest which needs to be won. The faces of the men, women and children relaxing in the Dean's Park told us that - a total absence of strain, tension, hurry or impatience. The beneficial influence on body and mind of the Minster and its surrounding buildings was plain to see, an all round sense of pattern, goodness and right order. This revealed itself again to me the following day at the early Mass at St. Wilfrid's, a stone's throw from the Minster's great West Doors. The priest, I recall, bent low over the candlelit altar, the Minster bells rang for a quarter past nine, and it felt for a moment like they were ringing for us as well - for the priest, for myself, for my neighbours and all gathered there - and not just ourselves but for everyone else - for my wife and child in the Park, for the townspeople up and about on a Sunday morning, sipping coffee and reading papers - and for more than these even - much more - for the men and women of all the historical ages gone by - Roman, Celt, Saxon, Norman and Dane - and those yet to come. The curtain lifted a little and I caught a glimpse, I think, of what W.B. Yeats found so compelling in Byzantium and why he called it the 'Holy City', and of what William Blake and Charles Williams saw in the streets and squares of London - nothing less than the great and timeless archetype of the Heavenly City - the Civitas Dei - the City of God. The bells ceased and the Mass continued, but their echo rang on in my mind. The enemies of the Good, the Beautiful and the True, I realised, can huff and puff all they want. They will never take the Heavenly City. It stands beyond their reach; anchored in eternity. Even if Byzantium were to be blown apart in some awful catastrophe, it would simply re-emerge somewhere else. Somewhere like York, for example. But, really, we know they are true - in essence if not in every detail - and the distinction should therefore be about whether we are aware of them, or unaware. Then having become aware, how we respond? This is the root of the problem of uncovering evil in high places. The lives of many people are more-or-less in service to the ruling elites and their goals - and it is hard to acknowledge that one has been diligently forwarding the progress of extremely evil people. Too hard for most secular people to admit - because this leads to paralysing despair. That is perhaps inevitable. In the short term we can only hope for demoralisation and despair as the intermediate goal; as the prevalent materialist hedonic life goals are abandoned but with no substitute - and pray that this state is brief; and that on the other side of it comes spiritual awakening. As the United States Presidential election process continues, I am recurrently surprised by the way that (contrary to my own wishes and predictions) things keep on working-out for-the-best according to the most important criterion: the necessity for a Spiritual Awakening in The West. Apparently bad things keep happening or not-happening - and soon after they have happened or not-happened I realise that things have worked out for the best in terms of demonstrating to the mass of ordinary people that The Establishment is corrupt to the extent of actively working for evil: working for the temporal destruction and spiritual damnation of the population of The West. We keep being led to hope that something will happen to slow-down the decline - but after all, without a realisation of the depth of the problem and repentance of what got us here, we know for sure that that would not be enough. Fortunately, due to their escalating state of panic (at having two generations of Progress snatched away just on the verge of their triumph) The Establishment are piling error upon error; are pushing their corruption and evil intent ever more aggressively into the faces of the ordinary people who - up to now - have been effectively bought-off and distracted by sexual 'freedoms' and mass media opiates. The masses have been sleepwalking into their own enslavement and spiritual destruction - but now they are being shaken awake; those with eyes to see can now see - if they allow themselves to notice and join-the-dots. It is becoming very obvious that none of the actually-existing ruling people, or parties, or institutions, or corporations are going to do anything-at-all to stop the ongoing trend towards corruption, destruction and moral & spiritual inversion. They are all neck-deep in corruption, and operate on grounds of fear, greed and expediency - not principle. So much is now obvious. It is indeed becoming very obvious that the current mechanisms (including 'safeguards) are the problem, and cannot be the solution; and if people want something doing to reverse things - then it will need to come from the bottom-up, and from new directions, and by new mechanisms. But this first step opens-up the possibility of the next step - which is a spiritual awakening, a positive programme based on courage and love. Yes, things are going as well as could realistically be hoped for! Belloc’s view of history, for the most part astute and penetrative, was always skewed by a less than balanced Francophilia and an almost shrill Germanophobia. This was evident in his dismissive disregard of the contribution to Christian culture of the Germanic tribes of England prior to the Norman Conquest and his lauding of the Conquest itself as having brought England into the fullness of Christendom which was always, for Belloc, synonymous with the influence of France. He might have shown that Anglo-Saxon England was profoundly Catholic, to such a degree that the saintly Englishman, Boniface, had helped to evangelize Pagan Europe, while his contemporary, the truly venerable Bede, had exhibited the high culture that Saxon England enjoyed in abundance. Tolkien might also have added a host of other Anglo-Saxon saints, from St. Edmund to St. Edward the Confessor, the latter of whom was eulogized by Shakespeare in Macbeth. There’s no doubt that the historical question of whether the Norman Conquest of England in 1066 can be considered a good or a bad thing for England in particular or for Christendom in general is a question worth asking, perhaps even answering. What is not in question is the Christian character of Anglo-Saxon England, in terms of the saints and the literature she produced. Pace Belloc, Tolkien could have shown that England, prior to the Conquest, was a beacon of Christian enlightenment which was not in need of the baptism of blood which the Normans unleashed at the battle of Hastings. Fifty-seven years had elapsed since Kirk had first drawn his literary sword and blown his literary trumpet ... What he might do to rouse others imagination and courage, that he had done, to the best of his limited talents. It remained to keep keen the edge of his sword of imagination for another decade or conceivably longer. As no great cause ever is wholly lost – to borrow a sentence from Eliot – so no great cause ever is wholly gained. 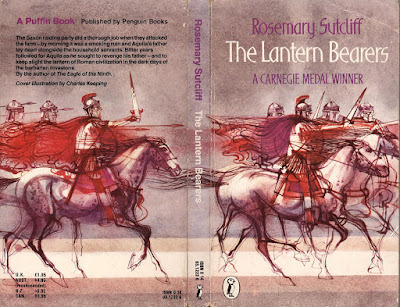 Rosemary Sutcliff (1920-1992) was a prolific British writer, renowned for her renditions of Gaelic, Greek and Arthurian myth, as well as her suite of novels set in Roman and post-Roman Britain: The Eagle of the Ninth (1954), The Silver Branch (1957), The Lantern Bearers (1959) and Sword at Sunset (1963). Though primarily a children's author, the depth and quality of Sutcliff's canon resonates strongly with readers of all ages. As with numerous British children's writers (Alan Garner and Susan Cooper, for example) whose formative years co-incided with the struggle against Hitler, Sutcliff's work displays clear distinctions between good and evil, right and wrong, civilized conduct and barbarism. There is no post-modern ambiguity, equivocating or hedging of bets here. We also find a firm commitment to the value of law and order (inherited from the Pax Romana) and an overarching belief in the significance and intrinsic worth of Judeo-Christian civilization. Justin looked at him quickly, but Flavius never moved: it was as though he had known what Carausius would say. The impressions that remain, however, once a Sutcliff book is finished, are poles apart from any kind of bitterness or impotent nostalgia. Her oeuvre is imbued instead with kindness, courage, a sense of the Divine shaping the lives of individuals and communities, and a compassion and understanding (though never a backsliding tolerance) of the enemy and his bleak material and spiritual situation. 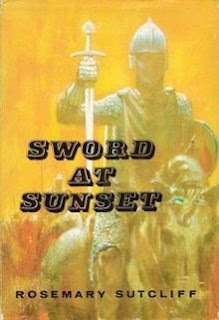 Sword at Sunset (a rare Sutcliff adult novel) is soaked in all these themes. A tempestuous 448 page narrative, spanning a forty year period, from approximately 470 to 510 AD, it tells the proud, mythically-charged tale of British resistance to those same 'Wolves' that threatened Carausius' frontiers – Saxon pirates turned invaders in the post-Roman vacuum. Here we arrive at the heart of the matter. It is the unquantifiable and intangible – not the immediate material reality – that carries most weight. The bare historical record tells us that Arthur ultimately failed in his mission. He was killed in battle, and his restored Roman Britain crumbled before renewed Saxon onslaughts two generations after his death. Yet as an icon and exemplar, his achievement is unparalleled. His legacy can be glimpsed in figures such as Joan of Arc, Charles de Gaulle and Winston Churchill, individuals who set the odds at nought and fought on for their dream when surrender seemed the only common-sense option. These themes are pregnant with significance for our own times. 'When there is no dream left worth dying for, then the people die.' Would Carausius recognize in our society the same germs of dissolution that compromised the Roman Empire? Civilisations, history tells us, tend often to disintegrate from within. The Soviet citizenry, for example, ceased in large measure to swallow the ideology driving the USSR long before that totalitarian edifice fell. There was a time lag, certainly, but once the Marxist state had lost its imaginative grip on the populace, its demise was assured. The same holds true for the creaking spiritual and intellectual foundations of the West. Enfeebled from within by a sceptical, overweening secularism, we turn our backs on our patrimony, 'refusing to inherit' (in Roger Scruton's phrase) the deposit of religious, philosophical and political wisdom handed down by our ancestors. Our moorings have been cut, and we are without recourse to that transcendent Deity who once animated our civilisation. If my truth is as good as your truth, then all 'truths' are equally worthless, and we leave nothing more than a vacuum for our children to inherit. Nature, as we know, abhors a vacuum. Vacuums will be filled, one way or another. In rejecting its past, the West has laid itself open for conquest and exploitation, either at the hands of a corrupted ruling class or through the ascendancy of a rival civilization with a clearer sense of mission and identity. Artos and Ambrosius refuse to submit. They rage hard against the dimming of the Roman light. The key question, as we have seen, is why? Why battle on, with all the costs that entails, when the long-term prognosis is so pessimistic? Would it not be easier, wiser even, to 'lie down and let it come'? This takes us back to Russell Kirk and the question he puts to his readers at the end of The Sword of Imagination – is life worth living? Kirk's reply is a resounding yes, and it is affirmation, this sense of shaping Divinity, this intimation of a wider, embracing pattern, that is so conspicuous by its absence in the contemporary West. We have killed our Kings (Charles I, Louis XVI, Nicholas II), then turned our blades on God Himself. Without God, as Dostoyevsky foresaw, our lives, both on the individual and the corporate planes, are divested of meaning and value. A numbing, insidious despair – oblivious to the myriad distractions we fling at it – chips away at our vitality, draining our civilisation of energy, hope and healing, restorative vision. Artos, in his discussions with Ambrosius and Bedwyr, seems tempted at times to lay down his sword and make an accommodation, however uneasy, with the Saxon presence. 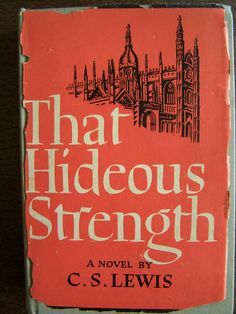 This occasional propensity to gloom is part of the fallible, charmingly human character Sutcliff has drawn for us. Artos is no 'man of steel'. A battlefield champion and unrivalled leader of men, Artos is almost comically gauche in his relationships with women (especially with his wife, Guenhumara), and far from sure-footed in his dealings with the Church and officialdom in general. He is a sensitive, thoughtful individual, prone to bouts of anxiety and boredom that only find relief with the return of the fighting season each spring. There, around the camp fire, sheltered by his brotherhood of hand-picked 'Companions', Artos is happy – in tune with himself, his men and the world around him. Despite his vacillations and disappointments, Artos never subsides. He pursues his course to its end. Though no philosopher or theologian, he seems to sense a wider web of meaning weaving its way through his story, above and beyond the triumphs and disasters, personal and political, that line his path. Dimly conscious throughout of a deeper, underlying harmony, Artos is most reluctant to act precipitously, sacrifice his principles and break the threads of fate, even when it would be most expedient to do so. He marries Guenhumara against his better instincts, releases the young Saxon chieftain, Cerdic, when any other commander would have had him killed, and turns down one opportunity after another to dispense with his troublesome son, Medraut, a corrosive influence bent on corrupting the esprit de corps Artos has so lovingly built up among his Companions. It is as if he somehow intuits the great body of legend growing around him many years later, sustaining and inspiring not only poets, scholars and soldiers, but countless men and women when all seems lost and the odds are piled remorselessly high. This is the archetypal context propelling his life and work, compelling Artos to stay his hand and sacrifice short-term gain for eternal, mythic renown. He is humble enough to recognise, however opaquely, this greater reality, and play his part without rancour or resentment. Even in the quantifiable, strictly historical realm, the 'real-life' Arthur was far from the failure he might have been deemed a century after his death. We can appreciate now, a millennium and a half later, just what a towering figure he was, the last Roman Emperor in the West and the first Medieval King. He stands as a bridge – a Pontifex – looking back to classical antiquity on the one hand and forward to the staggering achievements of Christian Europe on the other. Medieval Christendom, as the historian Christopher Dawson elucidated so eloquently, was a civilization that focused not on its own comfort and well-being, but rather on its author and creator, God. We might almost feel tempted to define the fruits of this outlook as civilization itself: the establishment of civic society, the foundation of the universities, the philosophy of Thomas Aquinas, the mysticism of Eckhart and Hildegaard, the creative vision of Dante, and the construction of the great Cathedrals that glorify the continent to this day. It is this spirit of service, this dedication to a higher principle, that we need to find again if our civilisation is to survive. We need to rediscover a scale of values, and reconnect with the depth and richness of our religious, intellectual, cultural and political patrimony. This is no time for self-abasement. Quite the reverse. We are called instead towards a declaration of faith in everything we believe in, stand for and hold dear, everything good, beautiful and true, in the face of encroaching darkness from within and without.